A song from the Rodgers and Hammerstein musical, “South Pacific” reminds parents that children are not born prejudiced: “You've got to be taught to hate and fear. You've got to be taught from year to year. It's got to be drummed in your dear little ear. You've got to be carefully taught.” Reversing the tide of discrimination, whether it be because of age, gender, disability, skin color, language or other factors, requires a conscious effort by parents to teach children to think in terms of respect for diversity and compassion for the individual. 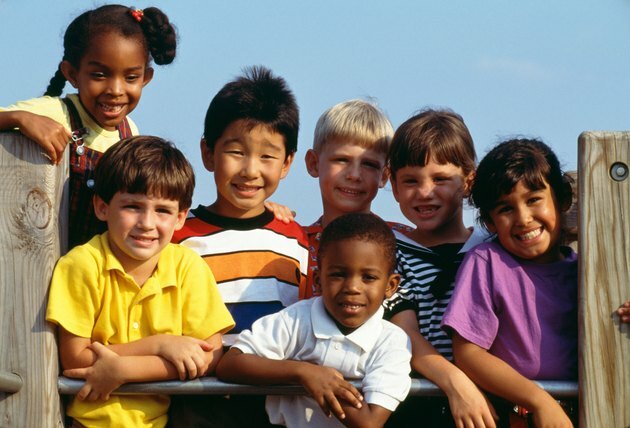 Surrounding children from a young age with activities that teach them about equality instills the idea of living in harmony and mutual respect for their fellow human beings. Children can quickly zero in on the differences between themselves and others, resulting in a sense of shame or overzealous pride, depending on how they view their own traits. A game of musical diversity can get them thinking more about their similarities. Play some music and allow the children to wander or dance around freely. When the music stops, they have 30 to 60 seconds to grab a partner and find one thing that they have in common. A game structured like a fact and opinion quiz show gives children practice at recognizing truth and falsehood in the conscious and unconscious assumptions they make about others. Make cards that display statements such as, “Girls are smarter than boys,” “People with accents aren’t very smart,” “Some rich people are stuck up,” “Christianity is a religion,” “Walla Walla is in the state of Washington,” or “All boys are good at sports.” Divide the kids into teams and take turns drawing cards and reading them aloud. The other team has 15 seconds to decide if the statement is fact or opinion and tell why for a point. Play as time allows. The team with the highest score at the end wins. Markers, crayons and construction paper of various colors set the stage for a variety of crafts that illustrate how much diversity exists among children who live, play and work together in relative peace and equality. Children can trace and cut out a handprint in their own skin color that can be used in a class bulletin board display showing the cultural heritage of the class members or made into a handprint wreath that combines all their classmates’ hands in one wreath of equality. Children can also make stick or paper bag puppets to tell stories of how they can get along with and show respect for someone who is different. Snack time can be an object lesson on equality for children. For example, pass out oranges, bananas or apples to a few of the children. When the other children cry “unfair,” ask them why it’s unfair and brainstorm together how you can divide the snack equally so everyone gets some. Briefly explain that it is just as unfair to treat someone differently because of their appearance, their clothes, their physical capabilities, skin color, language, etc., so it is important to give equal respect to all. Another edible option is to frost cookies or cupcakes with half white icing and half chocolate icing while discussing that people can live together in peace and equality even when they are as different from one another as night and day.